Portland Monthly Oregon’s 50 Best Wines 2013 “Sure-bet splurges” included 2011 Bethel Heights Casteel Reserve Eola-Amity Hills Pinot Noir ($60) and 2011 Antica Terra Botanica Willamette Valley Pinot Noir ($75). “Prized Pinots” included 2010 Soter Mineral Springs Ranch Yamhill-Carlton Pinot Noir ($50), 2010 Colene Clemens Vineyards Reserve Chehalem Mountains Pinot Noir ($45), 2011 Cristom Vineyards Mt. Jefferson Willamette Valley Pinot Noir ($30), 2011 Ayres Vineyards & Winery Willamette Valley Pinot Noir ($25), 2011 Cameron Winery Dundee Hills Pinot Noir ($26), 2011 Love & Squalor Willamette Valley Pinot Noir ($24), 2011 Crowley Wines Willamette Valley Pinot Noir ($24), 2010 The Eyrie Vineyards Estate Dundee Hills Pinot Noir ($35), 2011 Patricia Green Cellars Estate Vineyard Ribbon Ridge Pinot Noir ($30), and 2011 Vincent Wine Co Ribbon Ridge Pinot Noir ($24). Restoration of Hoffman Mountain Ranch The Hoffman Mountain Ranch (HMR) and Winery was developed by Dr. Stanley Hoffman in the early 1970s at an elevation of 2,200 feet in the Adelaida District AVA in the western hills of Paso Robles. The 1,200-acre site was originally planted under the guidance and direction of Andre Tchelistcheff in 1964. HMR began producing HMR wines, including Pinot Noir, in 1972, with Tchelistcheff as a winemaking consultant. The original HMR winery is considered the first modern commercial winery in Paso Robles. The historic HMR property has been purchased and renovated by Georges and Daniel Daou of DAOU Vineyards and Winery. The Daou brothers founded DAOU Winery 8 years ago, planting their mountain property with mostly Bordeaux grape varieties. In 2012, they purchased the remaining 112 acres of Hoffman Mountain Ranch, and began restoring the half century old redwood winery. The historic cellar is being used for the 2013 harvest. A ribbon cutting ceremony will be held October 20 with special guests Dr. and Mrs. Stanley Hoffman and Dorothy Tchelistcheff. Anderson Valley Trade Tasting in San Francisco On Tuesday, November 12, the Anderson Valley Winegrowers Association (AVWA) is organizing a tasting of wines from 25 to 30 Anderson Valley wineries at Fort Mason Center, with food pairings by local restaurants and purveyors. Other upcoming AVWA events include the Ninth Annual International Alsace Varietals Festival (February 8-9, 2014), the Seventeenth Annual Anderson Valley Pinot Noir Festival (May 16-18, 2014) and the Anderson Valley Barrel Tasting Weekend (July 26-27, 2014). For information visit www.avwines.com or contact Kristy Charles at Kristy@foursightwines.com. Santa Barbara County Vintners’ Association Celebration of Harvest Festival This annual weekend event, held October 11-14, 2013, will feature the signature Celebration of Harvest Festival on Saturday, October 12, featuring more than 100 winery members of the Santa Barbara County Vintner’s Association pouring at the Rancho Sisquoc Winery (tickets are $85). 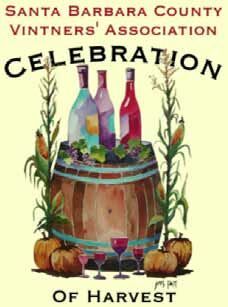 For details about the event, check www.sbcountywines.com. Visit the Santa Ynez Valley Hotel Association website at www.syvha.com for partnering accommodations. Soliste Continues Innovative String of Wines The latest release from Soliste, the 2011 St. Andelain Lake County Sauvignon Blanc, is a homage to the incomparable, late Didier Dagueneau, the “Master of St. Andelain.” Dagueneau single handedly revolutionized Sauvignon Blanc, bringing it to up the status of any Grand Cru white Burgundy. Known for his wild mane of unkempt hair and bushy beard, he was an iconoclast among vignerons and sommeliers. Though he had no formal winemaking training, he was infatuated with great Burgundies and used methods uncommon to Pouilly-Fumé, including severe pruning for drastically low yields, hand-harvesting of fruit over several successive passes through the vineyards, vineyard-designate bottlings, skin contact, and barrel fermentation. He also created his own barrels, the most famous being a cigar shape barrel. Dagueneau’s wines became the unchallenged leaders of Pouilly-Fumé, including Pur Sang, Silex, Buisson Renard and Asteroide. 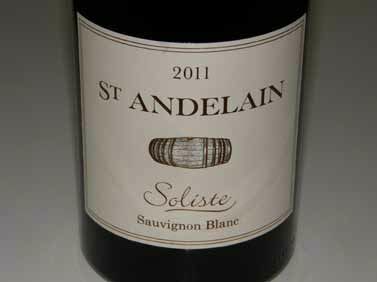 Soliste aim is keep the dream alive with their latest release from a single organic vineyard in Lake County, California, an area known for Sauvignon Blanc excellence. The grapes were destemmed and allowed 36 hours of skin contact to create unique richness and depth. After pressing, the wine was barrel fermented and aged for 16 months in Didier’s creation, the cigar barrel. There was no malolactic fermentation to preserve acidity, verve and length. Aldo Sohm, the Chief Sommelier at New York’s Le Bernardin restaurant, said, “This is the best white wine I have ever tasted, period, anyplace, anytime.” I can’t argue with that statement, having recently tasted the wine myself. Only 223 cases produced, $55, sold by allocation to preferred list customers at www.soliste.com. Soliste wines are also available at many of the finest restaurants in major metropolitan areas in the United States. Oregon Wine Industry Booming According to the Oregon Wine Board, the Oregon wine industry has an economic affect of nearly $3 billion annually. The amount of vineyard acreage and number of wineries has increased markedly each year since 2001 with 850 wineries now in production sourcing from more than 20,000 acres of vines. The American Wine Consumer Coalition in August gave Oregon the top ranking as the most friendly to wine consumers. Wine Catches Beer in Popularity As reported in the Wine Spectator, October 31, 2013, a Gallup poll in early July found that wine and beer were in a statistical tie as far as popularity among alcohol-consuming participants in the poll. The Gallup poll reported, “U.S. drinkers‘ preferences have shifted to the point that drinkers are now just as likely to say they drink wine most often as to say beer.” The Beverage Information Group 2012 Wine Handbook latest figures support the continued strength of U.S. wine consumption which increased for the 19th straight year. The wine industry grew 1.9 percent in 2012 to reach 318.0 million 9-liter cases. The most popular wines that drove the increase were un-oaked Chardonnay, Rosé, sweet wines, sparkling wines and red blends. Total wine sales in 2012 were $28.9 billion. DTC sales continue to grow, now contributing $1.4 billion to the industry. Latest Screw Cap Statistics Wine Spectator (April 30, 2013) reported the following percentage of wines bottled under screw caps: New Zealand 91%, Australia 70%, Oregon 25%, Argentina 15%, Washington 12%, California 8%, Spain 7%, France 3% and Italy 2%. 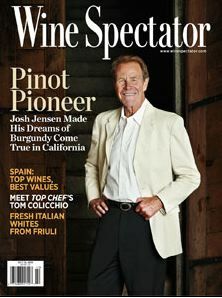 Josh Jensen Recognized in Wine Spectator In the October 15, 2013, issue of the Wine Spectator, James Laube pens a memorable tribute to Josh Jensen, the founder of Calera Wine Company. Titled, “Pinot Pioneer: Josh Jensen Made His Dreams of Burgundy Come True in California,” a few interesting facts came out of the article. The first property he bought in San Benito County in 1975 consisted of 320 acres and was priced at $18,000 and his second 320-acre property, purchased in 1982, cost $150,000, presumably because it had a water source. His first wine was a Zinfandel produced from purchased grapes. His first Pinot Noirs, from Jensen, Reed and Selleck vineyards, one barrel each, were made in 1978 and bottled in 375 ml format. All Pinots except de Villiers Vineyard are 100% whole cluster. Jacques Seyesses of Domaine Dujac in Burgundy noted in the article, “To me they (Calera wines) are the most Burgundian of California Pinots, and the ones that I have tasted that really age well.” I too find the wines are often relatively unapproachable when young, much like top red Burgundies, but blossom beautifully over time in the cellar. Orange Coast Magazine Wine Dudes Blog I have been writing a blog along with Eric Anderson, the other “Wine Dude.” Check out my recent posts on “Wine Label Lingo,” “Free Wine Search Websites,” and “Grape Radio,” at www.orangecoast.com/winedudes. I feature “Must-Try Wines of the Week” as well, which are most often a North American Pinot Noir or Chardonnay.